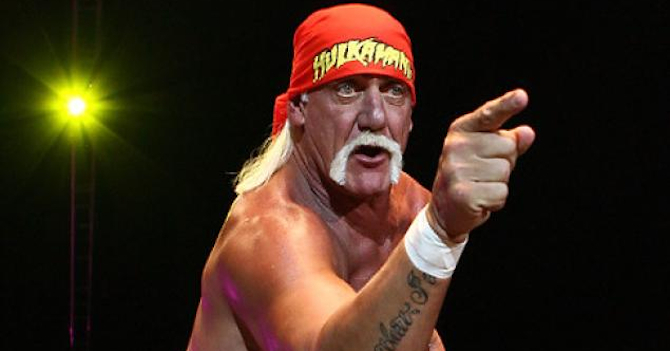 Hulk Hogan officially returned to WWE on Monday Night RAW this week. I can’t even lie. I NEVER thought this would happen. And while he leaked it on Twitter last week, this is still the biggest surprise return I think I’ve ever seen. I’m glad to see that Hogan and the WWE have settled their differences. I really hope this is the beginning of some changes for the company as a whole. I can understand the whole move towards kid-friendly entertainment. There’s BIG money in kids whining to their parents that they want the latest DVD or T-shirt. But as a fan since Undertaker had red hair, I feel like I’ve seen a steady decline in the quality of shows WWE has put out in recent years. Wrestlers who can’t talk are on the mic, wrestlers with limited movesets are in the ring. Characters in general just aren’t fleshed out very well. Maybe I’m just getting old. I miss the elaborate characters (think Macho Man and Undertaker) and soap opera-esque storylines. I miss seeing edgy NEW in-ring moves and variety. I would say I miss the bigger roster but they still have a large roster, they just don’t use them. When’s the last time you saw Curt Hawkins, JTG, or Yoshi Tatsu? I enjoy watching those guys, and they never see any screen time. I’m not saying they deserve title shots, but it’d be nice to see them a little more often than when some returning vet needs a warm-up squash match. Maybe they’re getting time over on Main Event and NXT, but the average fan doesn’t usually watch NXT. Personally, I have a whole folder of Main Event episodes on my DVR that I have yet to watch. I say this, because I’d rather see any of these guys in a 5 minute match on the big shows than yet another recap of the rivalry between Cena and whoever he’s feuding with at the moment. I’d rather see that than another dance contest between two wrestlers who can’t dance. If you’re going to spend all this time building storylines, does it have to be the same 3 stories? It’s overkill. By the time the match finally happens, I don’t even want to see it anymore, and then they have the nerve to set the same exact match for the next PPV. It just seems like lazy on creative’s part. Well that rant ran a little longer than intended. My point is, I hope that Hogan’s return is the beginning of a rollback to more creative programming. My favorite part of the Attitude Era was the Monday Night Wars. Shows were epic because WWE had some legitimate competition and were trying to win over the fans. I almost wish another company would come along that gave them some competition again, just so they would step their game up. But it shouldn’t take that. They should be giving us fresh, top notch content because they CAN. They have the resources to do so much more than what they’re showing us every Monday and Friday night. And maybe less wrestlers would be getting repeatedly injured if they weren’t having to kill themselves every week to fill a 3 hour show. How about showing the younger guys some love and letting them come out and wow us with their skills so the headliners can get a break? And while we’re at it, stop trying to sugar-coat huge athletes fighting with each other to keep the kiddies interested. It’s adult-level entertainment. Let it be what it is. Whoops, I went off again. What I meant to say was that I hope WWE bringing back an old icon means they’re going to start bringing back more old ways. I thought it would happen when the Rock came back… but umm… yeah. Hopefully Hogan is back full-time and can be GM or something. Make things interesting. Am I wrong? I’m open to all views on this so feel free to share yours. Previous post: What Happened at the Elimination Chamber?